The New Jersey National Guard ChalleNGe Youth Program is in business to give the youth of New Jersey a second chance at life. no surprise to Col. (Ret.) Kenneth Prossick, Director, Challenge Program. "At the ChalleNGe Youth Program, we take 16-18 year-olds who have quit high school, for whatever reason, and give them a second chance at a high school diploma,” stated Prossick. “We bring them to Fort Dix for a 22-week residency program and put them through the regimen of a military-style program. We help them change their attitudes and hopefully when they graduate they will have earned or be well on their way to attaining a high school diploma." The program, which is run by the National Guard and is active in 22 states, seeks to identify at-risk teenagers who have dropped out of high school, and gives them the motivation and direction they need to complete their schooling. Applicants must be New Jersey residents between 16-18 years old, drug-free, and not currently involved in the legal system. Although its military style program is similar to boot camps that work with juvenile delinquents, the ChalleNGe Program does not work with teenagers already in the justice system or on probation. It does, however, utilize some of the techniques used by the military to motivate soldiers during basic training. And just like the military, the ChalleNGe program is strictly voluntary. "Our core curriculum works towards academic excellence," says Prossick. "We focus on reading, writing, math, social studies and science. We also 'go heavy' on developing life skills – leadership, follower-ship, health and hygiene, citizenship, physical training of course, and we run this routine 24 hours a day, seven days a week, for 22 weeks." 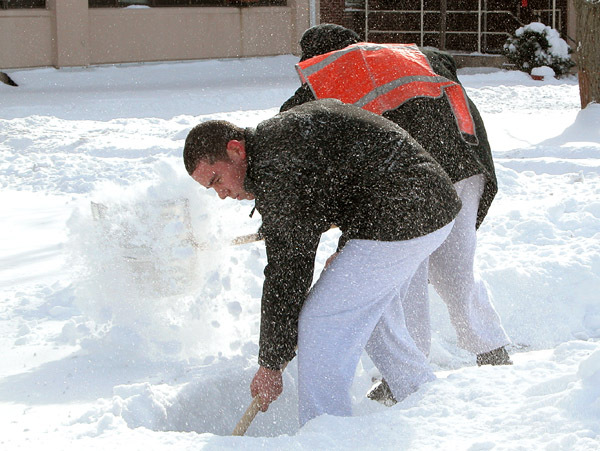 The cadets learn the importance of community service by shovelling snow for families of deployed soldiers at Fort Dix. They also have assisted with several Salute The Troop ceremonies. This 24/7 program takes place at Fort Dix, a military facility that used to be responsible for the basic training of United States Army Soldiers until about 15 years ago. The facilities at Fort Dix are perfect for the ChalleNGe Program, and Prossick and the other instructors make sure that they take full advantage of them. "All the assets of Fort Dix are available to us as are the assets of the New Jersey National Guard, and we make full use of those assets." Mentoring is an important part of Phase Two of the program. After completion of Phase One, the 22 week resident phase, adult mentors are assigned to each cadet after they leave Fort Dix. The ChalleNGe Youth Program is now the second largest mentoring program in the nation, and may be just the ticket for those teenagers who have left school and who feel they have lost direction in their lives. If you know someone who may benefit from the structure and discipline of the New Jersey ChalleNGe Youth Program, you can contact them at 1-800-997- 5587, or at www.state.nj.us/military/challenge.